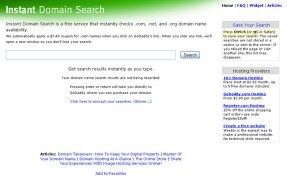 InstantDomainSearch is a free service that instantly checks .com, .net, and .org domain name availability. InstantDomainSearch was previously listed in our article 15 Domain Lookup Sites That Do It as You Type. If you enjoyed reading, consider sharing it on one of these social sites. Suggest.Name - The Web 2.0 Company / Website Name Generator. Subscribe to our feed and never miss another article. SingleFunction is a production of Webmasterish © 2009, all rights reserved. Proudly powered by WordPress, and the Showcastic Theme.